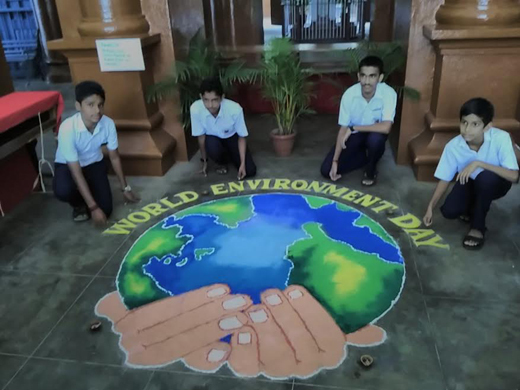 Mangaluru, June 06, 2017: Most schools in the city had some form of awareness creation to mark ’World environment day’ on June 5, Monday. Tree planting, cleaning the area, debates, discussions on the future course of action were the high lights. At St.Aloysius High School which is well past a century old and a very famous one at that, run by the Jesuits and having vegetation and environment that is maintained to high standards saw a unique colourful ’rangoli’ in the form of the logo of the Environment day. The Headmaster Rev.Fr Gerald Furtado with the staff and students organised an awareness talk and examining ways and plans to spread better awareness and action in the days to come. This was done as the school assembled at the start of the day. The ’Rangoli’ displayed at the entrance foyer, was a big attraction and motivator; not only the entire school admired it, but also many others and even journos ere fascinated by it. The idea and execution was by 4 high school students : Nishan S(10E2), Rahul Ramesh(9B), Rohan Pinto (9B2), Dheeraj (8).....their efforts were overseen and encouraged for betterment by teahcers. One key person of course was their well known art teacher John Chandran. Indeed on this day that is expected to make this world a better place, all concerned made an effort to get it started early. Wow beautiful Rangoli of the globe.